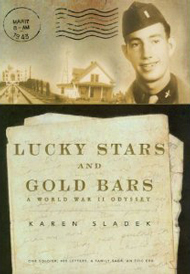 Bainbridge resident Karen Sladek is the author of Lucky Stars and Gold Bars: A World War II Odyssey (2004). The book is a collection of 400 letters written by her father during his service in World War II. Through the letters and Sladek's commentary we learn about her father's journey from a South Dakota farm boy to lieutenant in the Army Air Corps. The book is described as "A heartwarming family saga set at the time America emerged from the Great Depression and into the throes of World War II—told through a soldier’s 400 letters to his parents and siblings back home on the farm in South Dakota as he circled the globe by land, sea, and air." Sladek's book was a winner of the 2005 Benjamin Franklin Award. For more information go to http://www.luckystarsandgoldbars.com/.